On Saturday Keith & I completed the last of the chores getting everything ready for the start of excavation week. Sunday was a good day weather wise, the aim was to prove everything worked. Everyone convened at base by 9am except Dave & April who went to the boat yard to bring Halcyon to site as our second cover boat. 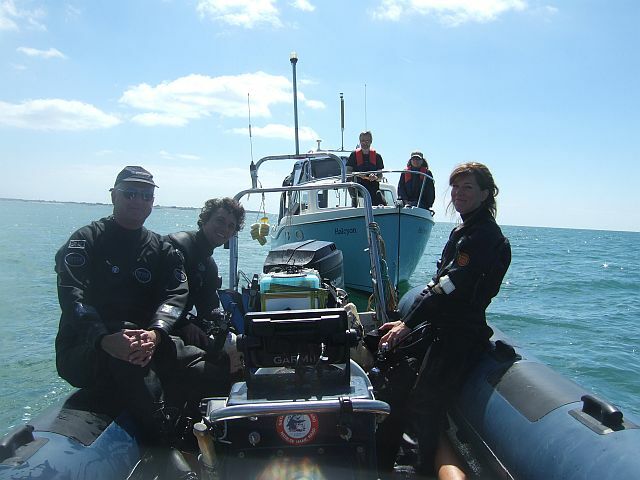 The RIB was launched by ten; loaded with air tanks, cameras, dredge pump, hoses & assorted paraphernalia & onsite by 10:30. Mooring set, boats tied off, divers in, only to find ba rely half a metre of visibility. Still we progressed & proved that it all worked with just a few tweaks here & there. We made one recovery, a pewter spoon handle & finishing the day thinking, “it will be better tomorrow”. Today we launched at 10am, into a force five plus from the south west. As Dave said: there is a reason why Hazardous finished up wrecked here in the bay! Time to retreat to shore & have a cup of tea. < Previous First Dive of the Year.